After some time in his foster home, his foster mom thinks that Leon probably needs to be in an only-bird home. When he is with other birds, he can be aggressive with them and with his humans. So for now he`s back to working with his foster mom one-on-one in a room away from the rest of her flock. He likes to come out of his cage now and is quiet, only making little chirps to communicate. 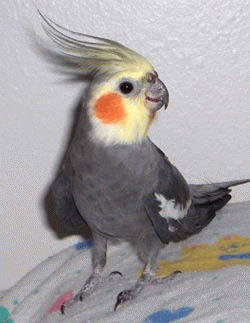 Hi - I am the very lucky cockatiel, Leon. Though I am a small normal gray guy, I have a brave heart! One day I suddenly found myself lost outdoors and very cold and hungry. And if that wasn`t bad enough, suddenly a dog grabbed me! But my guardian angel must have sent that dog because the dog was a well-trained hunting dog and gently `retrieved` me to his kind owner. I was then taken to a nearby avian vet who fixed me up in no time. Soon I had a foster mom here at Mickaboo and a warm cozy foster home. But what I really need is a permanent family. I`m a little shy and quiet, but I`m happy and I even eat pellets and some veggies! Maybe this time my guardian angel has sent you to find me?